Ever wonder why people buy smart watches? 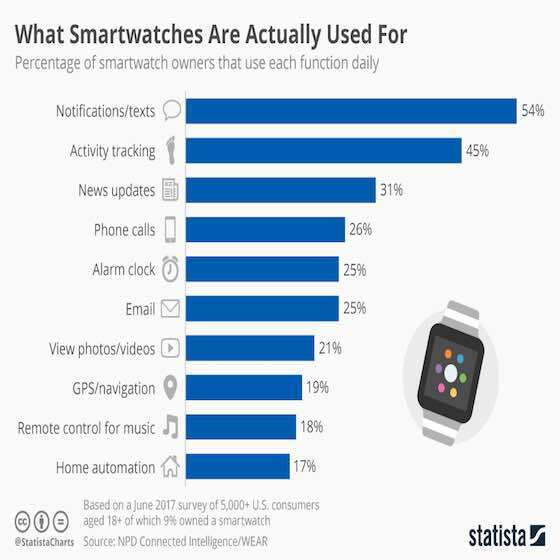 This chart shows the most popular uses and use cases for smartwatches. When Apple launched the Apple Watch in 2015, many expected it to kick-start smartwatch sales the way that the iPhone and iPad had boosted smartphone and tablet sales, respectively. And while smartwatches have definitely gained popularity over the past two years, they have yet to really take off and many people are still wondering whether they actually need one and what their added value is. According to data published by the NPD Group recently, nine percent of U.S. consumers aged 18+ currently own a smartwatch, which isn't too bad for a product category that many consider a flop. Apparently, the wrist-worn computers are used for a wide range of tasks with two features standing out: receiving notifications/texts and using the watch as an activity tracker. The chart above identifies what the most popular use cases for smartwatches are. Personal Tech & Gadgets "What Smartwatches Are Actually Used For"